Sail Away to Turtle Bay is fun for the whole family. 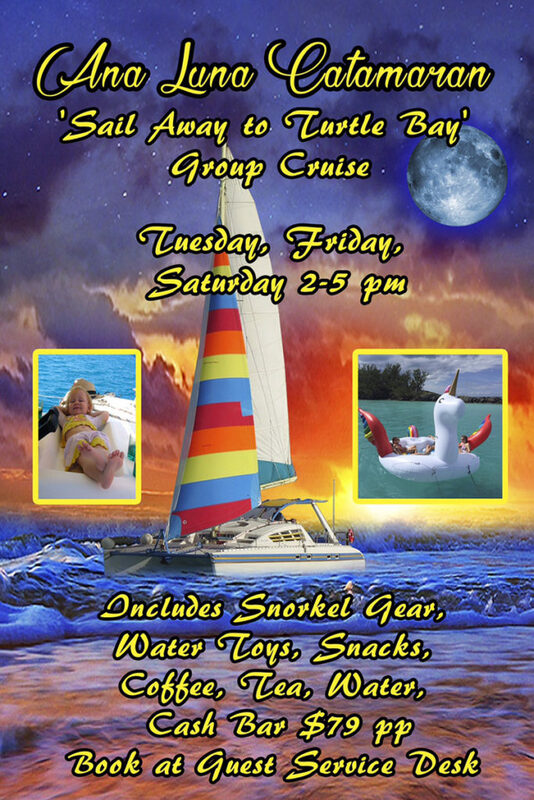 Everyone has lots of options from serious snorkeling to cannon ball jumps off the stern to maxi water toys and selfies! Turtles do abound in many coves and show themselves in the warmer months, they are shy but approachable and harmless. Many fish species and creatures are there to discover as well. So, welcome aboard and away we go, to ‘Turtle Bay’! Fun for all ages and abilities. Liability disclaimer: When you are in the water you are doing so independently and are confident in your abilities and equipment in the specific water experience. Ana Luna does all it can to make your swimming and snorkeling experience safe and enjoyable. Snorkelers abilities, reactions, physical condition, etc are far from the captain or crews ability to control and for this reason all guests who enter the water do so at their own risk and specially acknowledge this waiver of liability on the part of Ana Luna.